« China Dream » is a Liverpool based 9-month long season of exhibitions, performances, events and happenings which aim to shine a light on modern Chinese culture. 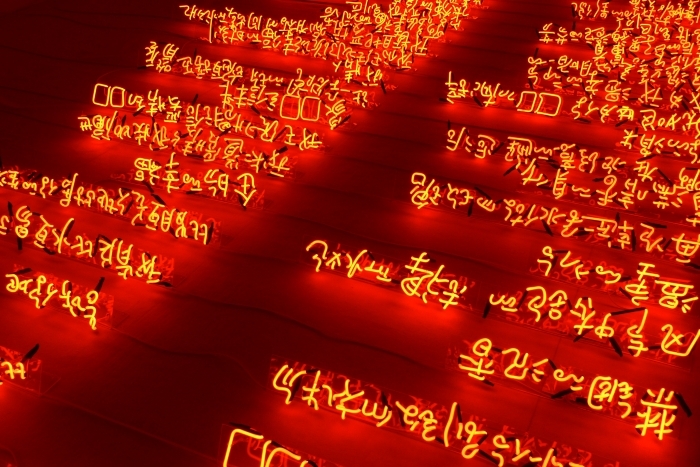 As part of this event, « This is Shanghai » is an art exhibition that explores and celebrates the relationship between Liverpool and its twin city in China. It brings together the work of ten leading contemporary artists from China, reinforcing a creative link between the two cities which are often compared due to their recognisable waterfronts and their shared architectural and emotional characteristics. The works are displayed in the basement of Cunard Building, in Mann Island, the Museum of Liverpool, Tate Exchange and the Pier Head, and include pieces by artists such as Xu Zhen, Yu Ji, Liang Yue, Yuan Gong, Zhang Peili and Zhou Xiaohu. « China Dream », organisé dans la ville britannique de Liverpool, est une saison culturelle de 9 mois de mise en lumière sur la culture moderne chinoise. Parmi les divers événements proposés, « This is Shanghai » est une exposition qui explore et célèbre la relation entre Liverpool et sa ville jumelle en Chine. Elle rassemble les œuvres d’une dizaine d’artistes chinois contemporains établis, dans l’objectif de renforcer le lien créatif qui unit les deux villes, souvent comparées pour leur port, leur architecture similaire et leurs caractéristiques émotionnelles. Les œuvres sont présentées à travers la ville, à Cunard Building, Mann Island, au musée de Liverpool, Tate Exchange et Pier Head, et incluent des pièces des artistes Xu Zhen, Yu Ji, Liang Yue, Yuan Gong, Zhang Peili et Zhou Xiaohu.